Affordable Scandinavian Style. That is what a watch by Skagen gives you. A Skagen watch is Danish design that is well-priced and stylish. The Skagen aesthetic is beautifully encapsulated by them: “We believe the world needs a retreat from complexity and a breath of fresh air”. That design philosophy can be seen in Skagen watches - simple lines and design, yet fun and quirky at the same time. These are watches that look elegant, yet good enough for everyday use. Skagen has an array of watches for both men and women in its wide product range, and Anytime is proud to be an official Skagen retailer. Every Skagen watch we offer comes with a manufacturer´s warranty, user´s manual and presentation box from Skagen. Affordably fashionable - what more could you ask for in a fashion watch? The history of Skagen watches began in 1989 when Henrik and Charlotte Jorst left Denmark to live in the US and pursue a dream: to own and run their own business and introduce the Danish way of life to the rest of the world. The company was launched on the idea that luxury products can be made available at affordable prices. 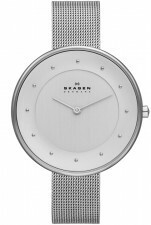 Collections from Skagen Denmark are known for their clean and elegant design. The Jorst couple is actively involved in the design process of every Skagen watch in their Danish collection. To keep up with changing trends, Skagen Denmark introduces new timepieces several times a year. This page is updated daily. This page was last updated on the . All Skagen Denmark logos, symbols, images and trademarks are protected by copyright. Anytime is an official retailer of Skagen Denmark watches.